Recently I returned from a trip to Austin, TX. If you have been in Austin, then you know that it is impossible not to run into one of these. This is an annual trip I make to participate in the SXSW music festival, and for several years I was misidentifying what I was seeing (and hearing) as Boat-tailed Grackles, a very similar species. Early on, it was thought that Boat-tailed and Great -tailed were related subspecies, but eventually it was confirmed that they are distinct from each other, having isolated breeding populations. Boat-tailed range is limited to the Gulf and Florida coastal regions. Great Tailed, on the other hand, is a species that over the last 100 or so years has benefitted from human activity, and as a result has greatly expanded its range. Around 1900, the most northern tip of that range barely extended into Texas, and now it nests in at least 14 states, and has been sighted in 21. Their preference for foraging in open grasslands allowed for adapting to foraging on lawns, pastures, and now, in city dumpsters. Their success has been so profound, that they are considered an agricultural pest, and urban annoyance (I don't know that I would call that success.). And cripes, speaking of urban annoyance, they are so loud! They waddle all over the place, on sidewalks, on lawns, as though they own the place and bray their sharp, mechanical calls. The males are glossy black, with highlights of blue and violet, and have a large tail that is often fanned out. 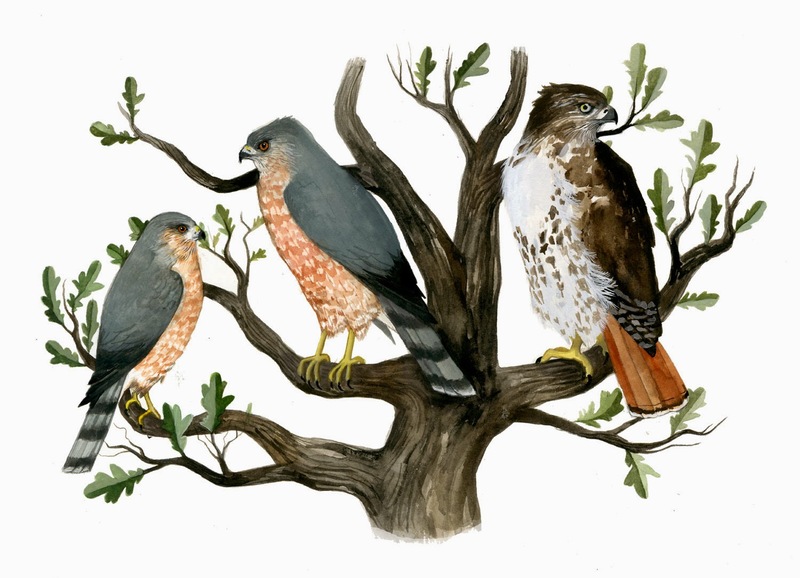 The females have a mostly brown plumage, and a smaller tail, but the same piercing, yellow eyes. A friend's house that we stay at, has a screened in porch that looks out onto their backyard. The trees are always full of screaming, puffed up grackles and cooing white winged doves. I loved that it's called "mexicanus" :p Never seen these around here though. I'm such a fan of your masterful use of watercolors, you always nail the complexities of the color black... Glad you had fun in Austin! We mostly get common grackles in our Kansas City backyard. 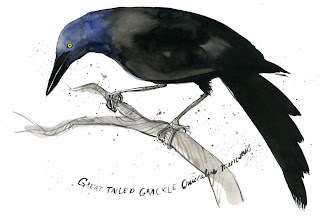 But, today, for the first time, Elly and I saw a Great-Tailed grackle. We had never seen one before. Elly said, Hey, look at this grackle. It is really big. She looked up grackles in our Sibley and we quickly realized it was a Great-Tailed. They are obviously larger than common grackles and the tails fan out remarkably when they fly. They seem a little pin-headed compared with common grackles. oh boy - maybe they are spreading north to your area. if so, brace youselves... they're quite obnoxious. pin-headed is a good word for it!